Hello everyone and welcome to another video in our series that guides you through our favorite plugins and online services! Are you ready for a great new tool for getting more visibility and traffic to your website? In this video I’m talking about Sniply, which is being used by hundreds of thousands of people to create even more engagement for their content! 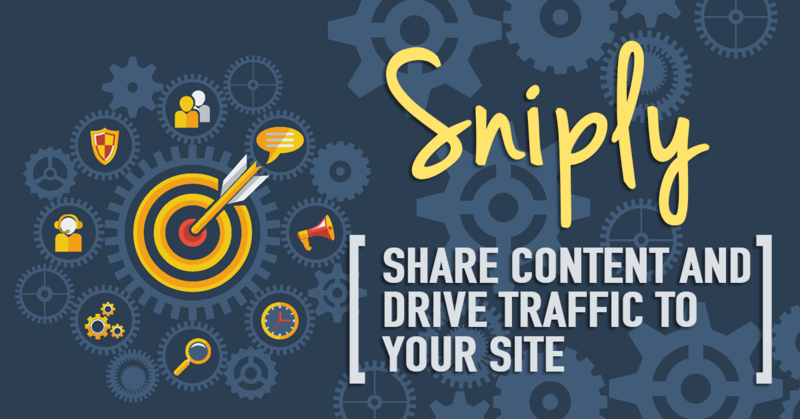 Sniply is fantastic to highlight great content on the web and point people back to relevant content on your site. You simply “Snip” the URL, with either their browser extension or their web app. Sniply creates a call to action button to show up directly on whatever content you’re sharing! This could be to your own website, kickstarter campaign, Etsy shop or anything you’d like to boost traffic for! This is an awesome win/win scenario for promoting someone else’s content, while creating a call to action button. And it shows up on their content that links back to yours! Sniply also lets you include a signup opportunity with every piece of content you share across social media. You can attach a simple signup form that connects to your mailing list to rapidly grow your newsletter. You can even leverage viral content like YouTube videos. You simple use Sniply to embed them directly into your own website with the click of a button. This drives the vitality back to you! It’s another win-win! So how do you start using this brilliant tool? The first thing to do is to head to snip.ly and register for FREE, so lets go and do that now! On the Sniply website, you want to click on Try Sniply for free. Then enter your details. All you need is your name, a password and an email address and you’re done! You’ll now be on your Sniply dashboard. This may look a little confusing at first but don’t worry it’s easy. You’ve got your toolbar on the left that has a getting started section. You can see manage your snips, integrations, account and resources. At the bottom you’ve got a quick way to create a snip as well, which we’ll get to in a moment! I’m in the Get Started section at the moment and as you can see it has a few things for me to do in order to learn how to use Sniply. Follow along with me and create your first snip! Now you have a few things to fill in about your snip. The page URL is the page you want to share and the page where your snip will be featured on. So, you’ll want to copy the URL from the site or blog post that you want to share. This can be found at the top of your browser. Make sure your URL has “http://” at the beginning for it to work properly. Paste the site or blog URL you want to share. Once you’ve got that, click on Create! You’ll see a new window with a place to get the newly snipped content with your call to action button on it. From here you can share your link on the social media channel of your choice or even preview how it will look when people check it out! This is where is gets fun and rewarding is when you can start to see clicks on your call to action button. You can now go to your dashboard on Sniply and track clicks, conversions, and manage your snips. Now you’re driving engagement from content that you already share and are getting more traffic back to your site. It’s as easy as that! Just use Sniply! By the way, we have so much more to share with you. This video just isn’t big enough to cover it all! Over on our website you can find tons more tools and techniques used by big companies! Check it out here! I hope you enjoyed this video. If you did, please give it a quick like and share it with friends! Thank you and see you in the next video!